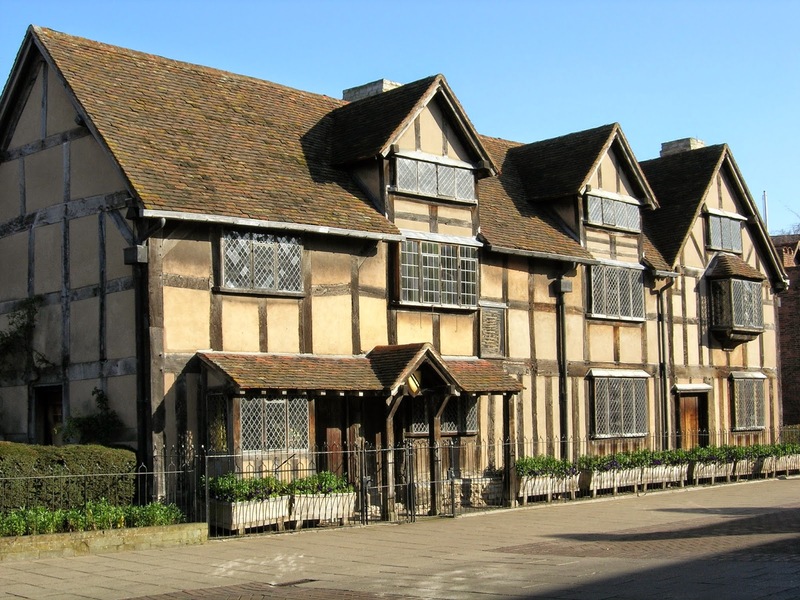 I'm often asked to take people on guided tours around Stratford-on-Avon to see William Shakespeare's birthplace and the other properties with the Shakespeare connection. The timber-framed Tudor style house in Henley Street, pictured on the left, was where the bard was born in 1564. We do not know the exact date of William's birth but the church register (a copy of which can be seen in Holy Trinity church) records his baptism as being on 26th April 1564. It's generally accepted that his birthday was 23rd April, three days before he was baptised, which was the tradition in those days. The birthplace is a fascinating place to visit and it's furniture is typical of the period. You'll see all the rooms including John Shakespeare's workshop, the downstairs room on the far right of the photograph, and the room where William was born. A walk to Holy Trinity Church passing the Royal Shakespeare theatre is highly recommended. In the church, so long as there's no important event taking place, you'll be able to visit the chancel to see Shakespeare's grave as well as the curse he'd had written on the stone to stop people from removing his bones. You'll also see the font, pictured on the right, in which William Shakespeare was baptised. Notice the wooden display case alongside where you'll see the parish records of 26th April 1564 and 25th April 1616 which show Shakespeare's baptism and his burial. From these records we can assume that he was born on 23rd April and died on the same day 52 years later. 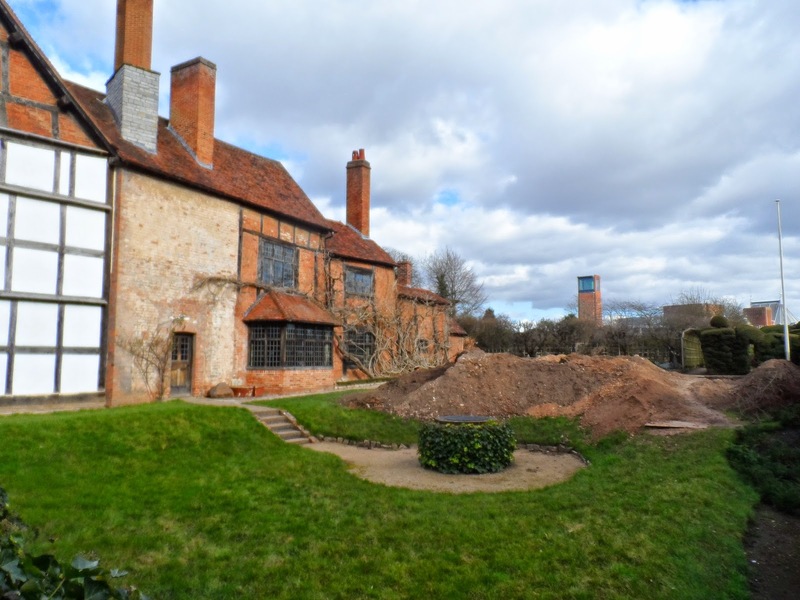 After leaving Holy Trinity Church in Stratford's Old Town, we'll pass Hall's Croft, where William Shakespeare's eldest daughter lived following her marriage to Dr John Hall. The walk will continue to the 15th century Guildhall. Historian Michael Wood describes it as ‘one of the most atmospheric, magical and important buildings in the whole of Britain’, alongside is the King Edward VI Grammar School. was taught probably from 7 - 14 years of age. William's father John Shakespeare a glover and wool dealer, held the office of town bailiff of the borough, so as a child, William would have been entitled to a free place at Big School, as it was known then. It was here that William's education would have included Latin, Greek, English History and Bible Studies. We get the feeling that he found the school day long and arduous because included in his description of the Seven Age of Man in 'As You Like It.' He refers to ...the whining schoolboy, with his satchel, and shining morning face, creeping like snail unwillingly to school. 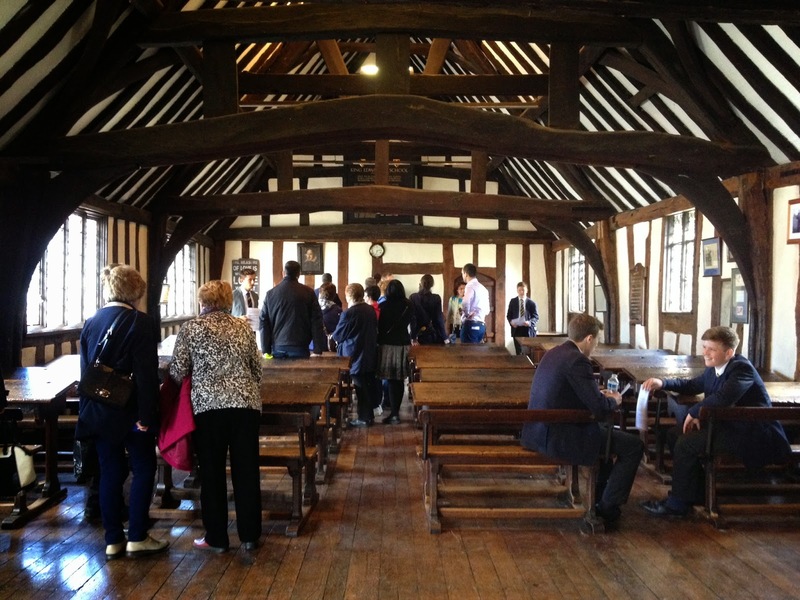 At the moment the school room isn't open to the public except on special occasions, but funding has been secured to restore the Guildhall and it's hoped to open both the hall and Shakespeare's classroom next year for the 400th anniversary of Shakespeare's death. William Shakespeare bought & retired to. will look in the future. A beautifully ornate timber framed house has been opened to visitors this year, whilst Nash's House and New Place are closed. Shakespeare will have known the building, which is on the opposite side of the road to New Place. It was built by a wealthy businessman Thomas Rogers in 1596. Thomas's daughter Katherine married Robert Harvard and they lived in London until the plague hit the city in 1625. Only Katherine and her two sons John and Thomas survived the plague but they returned to Stratford to the house Katherine had inherited from her father. The connection with Harvard University, America. Katherine and Robert's son John Harvard went to Cambridge University. After his studies he married, then in 1637 he and his wife emigrated to Massachusetts, America. John worked as a minister and a teacher but sadly died of TB. The Massachusetts Colony were they lived and worked were raising money for the establishment of a college, and John who had inherited a large amount of money donated it and his large library of books to the founding of the college. The college was named after him, and is called Harvard University today. After a walk around Stratford looking at the properties connected with Shakespeare and also the other historic buildings and places that make up this fascinating ancient market town, we can visit Anne Hathaway's cottage at Shottery and Mary Arden's House at Wilmcote which are a short drive away from Stratford-Upon-Avon. Copyright 2013 Tour and Explore. All Rights Reserved.